Dance of Death is a Roguelike to watch! I just spent a little bit of time with the ARRP release v0.6.136 of Dance of Death by Nolithius and am thoroughly impressed. I’ve had Ebyan’s site bookmarked for a while but forgot about keeping up with his progress until I revisited the site to play through his 4DRL project, Chronophase. I highly recommend you give Dance of Death a try and follow its development closely. It already has an epic feel and a satisfying level of difficulty that is sure to keep me coming back for more. The game drops you in the middle of nowhere with no memories except a quest to go dungeon diving in pursuit of some unknown quarry. Where it goes from there remains to be seen, as the game ended after I escaped the first dungeon. What’s unique or interesting about Dance of Death? The character creation lets you customize your character without feeling cumbersome, including a few different races, 8 attributes, and a categorical list of skills to boost. 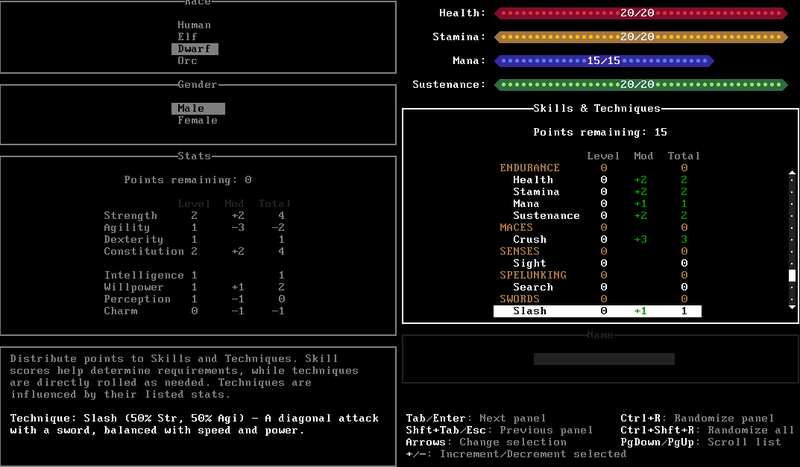 Gameplay itself plays out in a large Flash window with three panels: a main play area with a large ASCII map, a character stats summary, and a message area that shows combat messages, journal notes, inventory, and more. You start somewhere on a large island with the goal of finding a dungeon entrance in the highest peak of the mountains. 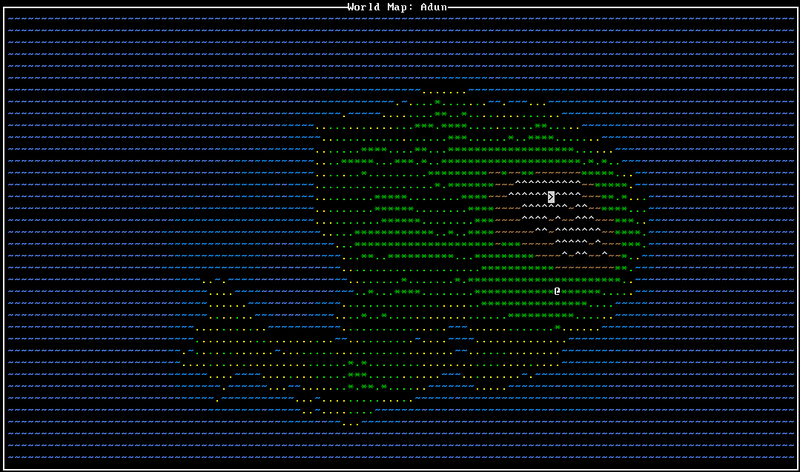 Ebyan has blogged about the world map generation routine, a worthy read for developers and Roguelike enthusiasts. All the maps I’ve seen look quite nice, and the ASCII map for each tile on the world map is adjusted to match the terrain on the world map. Ultimately you’ll travel through the mountains and find the dungeon entrance to descend in search of your prey. As you wander around and enter combat, you’ll inevitably take a fair amount of damage. At its present state, there’s no magic to speak of, so spend your points buffing your HP / stamina/ sustenance. HP does not automatically regenerate until you eat some food (one of the many monster corpses – don’t pass them up!) that will refill your stamina and “revitalize” you, causing you to regenerate HP for an amount of turns determined by the type of corpse you ate (I believe). The controls are also simple; press H when you get in for the full listing. 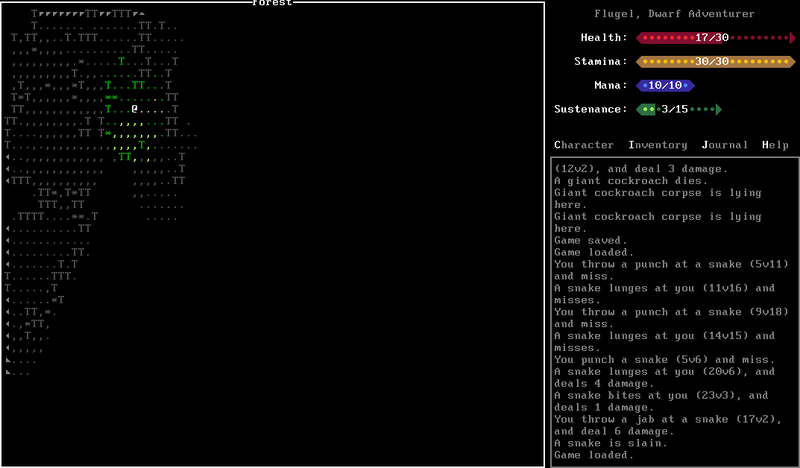 I found it quite easy to play with my left hand in its natural typing position and my right hand on the numpad. Most everything should be in reach with the exception of the map key, but you really only need to refer to that to find out which direction to head to find the cave. ~ by roguewombat on November 1, 2010.